I bought this back in December thinking it would be a good replacement since I did not have the factory splitter on my saw. The thought was lets make it safer until I buy my new saw. I had read many mixed reviews on the splitter and figured that maybe the bad reviews had to do with how people had been installing the splitter. It is just like any other splitter that you find on the uni-saw and the later contractor saws that have been discontinued. I got it home unboxed it, removed the old splitter bracket and installed the bracket for the new one. Simple enough, its held in with two cap screws. Put the splitter in the holder and it rocks back and forth. OK this isn’t right. I email Tools-Plus where I bought it from to find out if I could just UPS it back instead of driving over to return it. I get a reply from them saying to call Delta that the Delta rep told them that it had to go thru Delta. I call Delta and the tech says to me that it’s not supposed to have play and that the merchant has to replace it. I call the merchant and speak to the person who emailed me and explained to them what is going on and they sent me an RMA 5 days later. In the mean time I have written an email to Delta telling them the situation and that I was unhappy with the product and that I was in the market for a new saw but if this was any indication as to the build I would look elsewhere. A Delta rep calls and says they will send me a new splitter but they have to locate it in the warehouse. It is now Christmas and I hear from no one. I call them back and after New Years and am told that the person that would know where the item is was on vacation. We have gone back and forth 3 more times and nothing. So my rating is 0 for the splitter, -1 for Delta and a 4 for Tools-Plus. I will assume you will be looking else wear for your new saw as well. I cant say enough good things about my saw stop As well as the powermatic tools I own. I was in the market for a splitter for my Unisaw as well. I wasn’t happy with the reviews of Delta’s options either. I order a splitter and guard from http://leestyron.com for my Delta Unisaw. It works great, the price was right for me, and it’s rock solid. Made in the USA. I did have two wait about 6 to 7 weeks from the time I went on a wait list to delivery however, the wait was made clear before I ordered, I was not charged until he shipped, and it was well worth the wait. I would definitely order again. Sorry to hear about your experience with this splitter. I have one on my PowerMatic 66 that I bought and installed back in the mid 90s when it was still owned by Biesemeyer, and have had great luck and no complaints using it for ripping (don’t like it or use it for cross cutting). Doesn’t bode well for Delta which too bad. @ the dude I am looking going to go SawStop that is the saw I have been eyeing. @Rocko I am on the wait list for the splitter from Lee. I should have just gone with my gut and ordered it. @John I have heard to many negatives recently about Delta, I was going to buy my lathe from them and heard some negatives and spent more for the lathe I truly wanted which was the Nova DVR that I can’t say enough about. That ground spot on the base of the splitter is weird… Are you sure you got a new item? 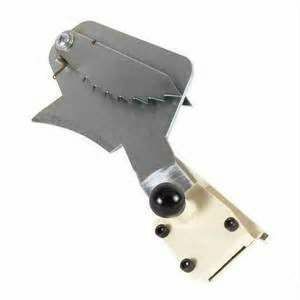 I’ve used these on other people’s saws, and they shouldn’t move, and they didn’t have that shiny area. BTW… +100 on SawStop, for quality alone.. I think Tools-Plus sells them. If not, I can recommend Woodcraft in Manchester and Coastal Tool in West Hartford. I’ve done business with all three. The picture of the splitter is from the Internet. The one I bought wasn’t ground down. How does Tools Plus get 4 stars out of this, sounds like they should get a zero. All the tool dealers I’ve dealt with have similar policies. They only returns they accept are new, unopened, fully resalable stuff. Anything used or defective is routed through the manufacturer’s warranty and/or repair channels. For example, over the years, I bought a band saw, with parts missing from a sealed box, from Woodcraft, and a DJ20 with a similar issue, from Tools-Plus. Both sent me directly to Delta… I’ve been in the store at another local tool dealer, Coastal Tool, and have overheard people being directed to a local repair depot. While it would be nice for the retailer to take it and run, I give Tools-Plus credit for putting the policy right out there, in black and white. Rick, they Tools-Plus took the part back. I did as they asked and called Delta, when Delta said it wasn’t ther issue I called Tools-Plus back and they sent me a RMA and shipping label. Funny thing is Delta emailed me the other day asking if I still needed to exchange the splitter. They were sorry it took so long to follow up due to the holiday schedule. Ah, so you did use the RMA. Did Tools Plus send you a return shipping label or just an RMA#? Also rewards from bonus offer benefits as well as loginn.me they make use of to on a regular basis evaluate your account. Just what an Android TV box is Voog there’s no general definition for Android TV Box these streaming boxes, as well as Get brand new Android TV Box it shows up that some don’t even Best Android TV Box run Android TV is as well as want Get More some purchasing advice.